Believe it or not, I cut my own hair. Not half as scary as it sounds; in fact it's relatively easy to do and saves me loads of time and money. My main problem is getting my fringe right. Sometimes I just chop it off and it looks like a block of hair rather than a nicely shaped fringe so I was rather intrigued to try out the Scunci Fringe Cut Clip as a way to make my fringe cutting much more simple! I've never really heard of the brand before however after a quick google I see that they are specialists in hair styling, care and products for "Effortless beauty". The Fringe Cut Clip is basically a GIANT clip with a fastening at one end so it locks into your hair. 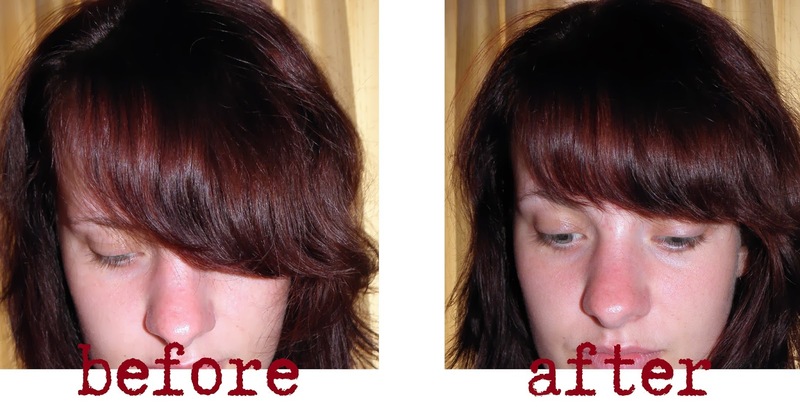 All you are required to do is clip it into the position you would like your fringe to be and cut away! If you just need a trim, you can place it on the ends of the fringe and snip off the ends making your fringe a more suitable length. I found the clip relatively easy to use. It's a very simple concept and in a weird way I feel a little cheated of my money because it is just a giant clip to use as a guide. The main benefit of using this over clips is that it has the fastening at the end which does lock it into place so you get a very straight fringe. As you can see in the pictures below, it left me with a very straight cut fringe. It was the perfect length and the clip acted as a fantastic guide for the trim making it much less fiddly than normal however my fringe lost its usual shape. I'd recommend this product for people, like me, who just want to trim their fringe every so often or in between hair cuts. If you're looking for something to help shape your hair, the Fringe Cut Clip isn't a product for you. I keep seeing these around but I was a bit unsure on them! It did a great job though, what a great find! I have one of these and I found it quite tricky to use! Although I probably need some better scissors, ha!